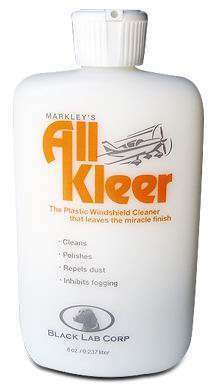 All Kleer was invented by a pilot over 25 years ago for cleaning and maintaining plastic aircraft windshields that require absolute clarity. All Kleer is different than most windshield products on the market as it not only cleans dirt, bugs and grease but leaves a very fine, slick finish. This finish helps to repel water, dust, bugs, and water spotting - making it easier to see and to clean the next time. All Kleer contains no wax, ammonia, or abrasives and does not require the use of any water. A non-pressurized leak proof 8oz bottle is designed to be carried on board if desired. Simply apply All Kleer with a clean towel to a dry windshield cleaning off any bugs and dirt and allow 30-60 seconds for a haze to form. After it has completely dried, wipe off with a clean towel and feel the All Kleer finish. Owners of airplanes rely on All Kleer to keep their plastic windshields free of dirt and grime, on the ground and up in the clouds. The super-slick "miracle finish" left by All Kleer makes it harder for any foreign substances to adhere to the plastic. Cleans- Dissolves grease, bug residue and other substances…. fast! Simplifies airplane maintenance. Polishes - Nothing sticks but the shine… and improved vision. You can see and feel the difference! Repels dust - Super-slick finish doesn't allow dirt and dust to accumulate. Makes cleaning easier the next time! Safe - No ammonia, wax or abrasive. No water needed. Convenient - Non-pressurized 8 oz. size bottle with no-leak top is perfect to carry onboard the aircraft. Best aircraft window cleaner year around. Pros: Compact, affordable, good in cold weather, easy to use. Review: I have tried a number of aircraft window cleaners and strongly prefer All Klear. Many products don't work well in cold weather because they separate or don't spray reliably etc. Giant aerosol sprays are a bod choice for cold weather, portability and leak potential if the cap gets knocked off. Some cleaners require extraordinary effort to apply and use. All Klear cleans well with minimum effort and rubbing, it is affordable and compact too. Pros: easy to apply with minimum effort. Review: This product is terrific. The key elements are the clearness and the lasting power. I use this on golf cart plastic windshields. We have a fleet of 100 carts so the less time we spend on cleaning the more time we have to spend on other areas. Review: I picked up a sample of All Kleer at AirVenture in Oshkosh this year. I applied it to my Road King windshield in August and was immediately impressed at how clear the windshield appeared and how slick it felt. But then I forgot about it... until yesterday when I went on a 300 mile ride and ran into several Taliban grasshoppers at 70mph. Today I was dreading the cleanup but when I started hosing down the windshield in preparation for some serious scrubbing I was shocked to see the messy insect remains completely wash away with just the hose. Then I remembered applying the All Kleer and was instantly convinced that this is a fabulous product. I don't know what the difference is between the Aviation and the Motorcycle versions of All Kleer but I'm placing my order today. Review: This product works pretty good. I've used it on our flight school aircraft, which sit outside all the time. It helped to fill in some of the scratches from using "non-approved" methods of window cleaning (like cheap,woody paper towels and water!) Water beads much better and clears off faster than without All Kleer. Worked nicely on the canopy of our DA-20 too. Can't find too many faults, except it can be a bit messy to use compare to aerosol. Review: I used the product last night in preparation for my morning commute, and I am very pleased with the results. Riding a motorcycle in the winter in Colorado really puts the anti-fogging attributes to the test! However, the biggest benefit seems to be in handling the extremely bright rising and setting sun at either end of the work day. Little micro scratches have disappeared - giving me a much better chance to pick out changes in the road surface, car turn signals and brake lights, and so on. Hopefully, it will repel dirt as well as it does these other tasks! Q: I have an original 64FL Harley Davidson, the windsheild is very scratched and hard to see thru. Will this product help remove scratches? A: All Kleer is the ideal solution for all riders, whether they own a Vespa or a Harley. All Kleer cleans fast and leaves a super-slick "miracle finish" that helps repel foreign substances. However, this product will not remove scratches. You might be interested in our Scratch Off Aircraft Windshield Repair Kit which will work on Plexiglas and Lexan surfaces to remove scratches. Q: Will All Kleer be safe for the inside of clear plastic or plexiglass drinking glasses? A: No, it should not be used for a drinking glass. Q: I would like to know if the all kleer can be used on automotive windshields, I do not if they re plastic or glass, and can this product also be used on glass? A: This product is specifically made for use on plastic windshields and is not recommended for automotive use on glass windshields. A: Yes, this should work fine on a golf cart with a plastic windshield. The All Kleer is a liquid cleaner and polish, while Plexus is only an aerosol cleaner.